Sectionalism: Excessive concern for interests of section. The excessive concern for the interests of one group or area to the detriment of the whole. In the years before the Civil War the political power in the Federal government, centered in Washington, D.C., was changing. Northern and midwestern states were becoming more powerful as the populations increased. Southern states lost political power because the population did not increase as rapidly. As one portion of the nation grew larger than another, people began to talk of the nation as sections (U.S. 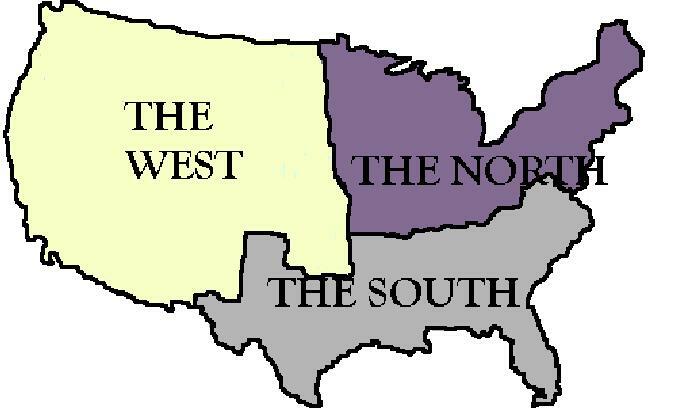 Regions: West, Midwest, South and Northeast). It was referred to as Sectionalism. Just as the original thirteen colonies fought for their independence almost 100 years earlier, the Southern states felt a growing need for absolute freedom from the central Federal authority in Washington. This topic was referred to as Secession. Southerners also believed that state laws, according to the Bill of Rights to the U.S. Constitution, held precedence over Federal laws, and that they should abide by the state regulations first. This issue was referred to as States' Rights and it became a very heated topic in congress. "A well-written, traditional, and brief narrative of the period from the end of the Mexican War to the conclusion of the Civil War... Shows the value of traditional political history which is too often ignored in our rush to reconstruct the social texture of society." -- Thomas D. Morris, Civil War History. "Tailored for adoption in college courses. Students will find that the author has a keen eye for vivid quotations, giving his prose welcome immediacy." -- Daniel W. Crofts, Journal of Southern History. This historical study reduces sectionalism to its most fundamental form, examining the underlying source of this antagonistic climate. From protective tariffs to the expansionist agenda, it illustrates the ways in which the foremost issues of the time influenced relations between the North and the South. Howe's panoramic narrative portrays revolutionary improvements in transportation and communications that accelerated the extension of the American empire. Railroads, canals, newspapers, and the telegraph dramatically lowered travel times and spurred the spread of information. These innovations prompted the emergence of mass political parties and stimulated America's economic development from an overwhelmingly rural country to a diversified economy in which commerce and industry took their place alongside agriculture. In his story, the author weaves together political and military events with social, economic, and cultural history. He examines the rise of Andrew Jackson and his Democratic party, but contends that John Quincy Adams and other Whigs--advocates of public education and economic integration, defenders of the rights of Indians, women, and African-Americans--were the true prophets of America's future. He reveals the power of religion to shape many aspects of American life during this period, including slavery and antislavery, women's rights and other reform movements, politics, education, and literature. Howe's story of American expansion -- Manifest Destiny and sectionalism -- culminates in the bitterly controversial but brilliantly executed war waged against Mexico to gain California and Texas for the United States. By 1848, America had been transformed. What Hath God Wrought provides a monumental narrative of this formative period in United States history. The book's title refers to the sentiments that informed both the Northern and Southern views of the conflict. The South seceded in the name of that freedom of self-determination and self-government for which their fathers had fought in 1776, while the North stood fast in defense of the Union founded by those fathers as the bulwark of American liberty. Eventually, the North had to grapple with the underlying cause of the war, slavery, and adopt a policy of emancipation as a second war aim. This "new birth of freedom," as Lincoln called it, constitutes the proudest legacy of America's bloodiest conflict. This authoritative volume makes sense of that vast and confusing "second American Revolution" we call the Civil War, a war that transformed a nation and expanded our heritage of liberty. . Perhaps more than any other book, this one belongs on the bookshelf of every Civil War buff. Hailed as a film masterpiece and landmark in historical storytelling, Ken Burns's epic documentary brings to life America's most destructive-- and defining--conflict. With digitally enhanced images and new stereo sound, here is the saga of celebrated generals and ordinary soldiers, a heroic and transcendent president and a country that had to divide itself in two in order to become one. Plot Outline A comprehensive survey of the American Civil War. Plot Synopsis: This highly acclaimed mini series traces the course of the U.S. Civil War from the abolitionist movement through all the major battles to the death of President Lincoln and the beginnings of Reconstruction. The story is mostly told in the words of the participants themselves, through their diaries, letters, and visuals are usually still photographs and illustrations of the time, and the soundtrack is likewise made up of war-era tunes played on period instruments. Several modern-day historians offer periodic comment and insight on the war's causes and events.